Jay and I are 12 years in, and although we love each other more than ever, we still easily fall into a rhythm that looks more like we are just good friends or roommates instead of the newlyweds we used to be. We try to have regular date nights, but busy schedules, babysitters, and the expense of going out makes that difficult. And date nights at home tend to result in us sitting on the couch eating dinner while catching up with whatever’s on the DVR. Jay and I just went through one of those hum-drum phases of our marriage, and at some point we both realized that we hadn’t had a date night in months. And that’s when my amazing man stepped up and planned one of the most romantic and fun in-house date nights we’ve ever had. He ordered take out (including dessert! ), and told me that we’d be writing down our bucket list ideas. In 12 years of marriage we’d never talked about the things that we’d love to do before we die. The funny thing is that I’d just returned from a trip with a friend, and she and I had spent some time discussing our bucket lists with each other. So even though I’d never really given it any thought a few days prior to that trip, I had the start of my list ready to go for date night the day after I got back! We decided to write our items down on index cards and share them one at a time. This way we could (try) to prioritize them, as well as see which things fell on both of our lists. We took turns diving into the backstories and reasons for the things on our lists, as well as plotting out how we could make them come true. It was fun to learn things about each other that we’d never known before. I knew that Jay loves to drive fast, but I’d never heard of the Skip Barber school and didn’t know that just anyone could get a racing license. He knew I love swimming in cold water, but wasn’t aware of how badly I wanted to complete a Polar Bear plunge. 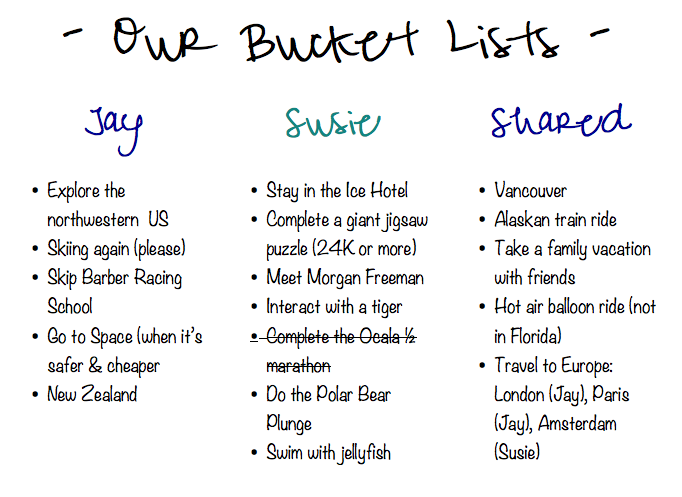 The best part was seeing that some of our bucket list cards were almost identical. We’d talked about taking a trip to Alaska, and almost chose to take our upcoming cruise there instead of the Caribbean. Now that we know how much we’d both love to go – and especially take a train ride through the mountains there – we’ve already begun looking into that as our next big trip. Next KID Hero 5K – A Super Race! I love this so much!!!! What a great idea! Way to go, Jay! I’m thinking John and I need to write ours down too. We’ve talked about some of our wishes many times but never actually wrote them down.